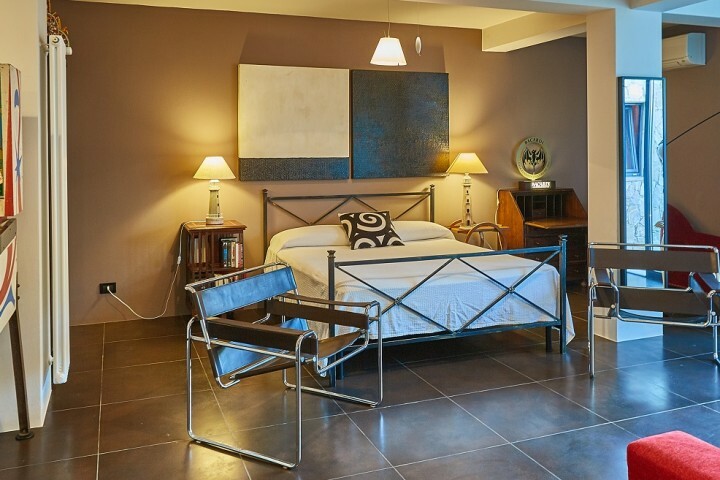 Taormina, the jewel in the crown of Sicily’s east coast, is one of the island’s best loved towns, and for good reason. With its dramatic coastline, gorgeous beaches and enticing shops, the town offers endless possibilities for a perfect holiday. 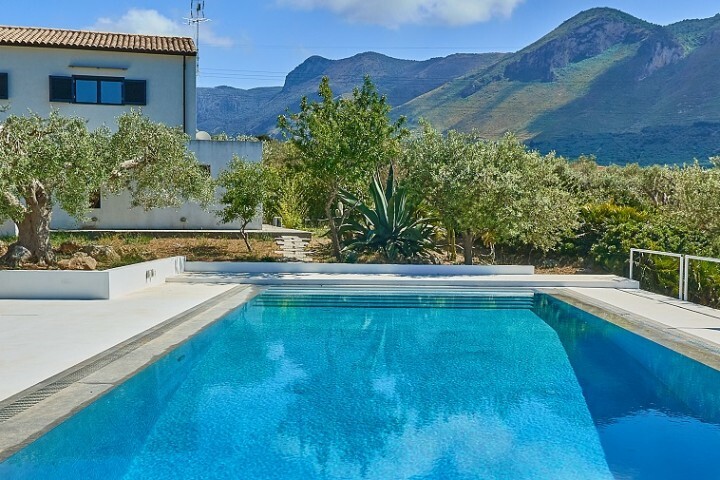 Choose your best time to visit Taormina Sicily and decide from a collection of luxury villas in Taormina with pools and sea views and pair a week of sun-drenched relaxation with some gentle sightseeing. Let’s see together which places to visit Taormina Italy. Beaches in the area vary enormously, from sandy to pebbly and in size, from the small bay of Mazzarò to the long golden beach of Giardini Naxos to the south of Taormina. There are plenty of free beaches but there are also private lidos, with sun beds, umbrellas and seafront restaurants. 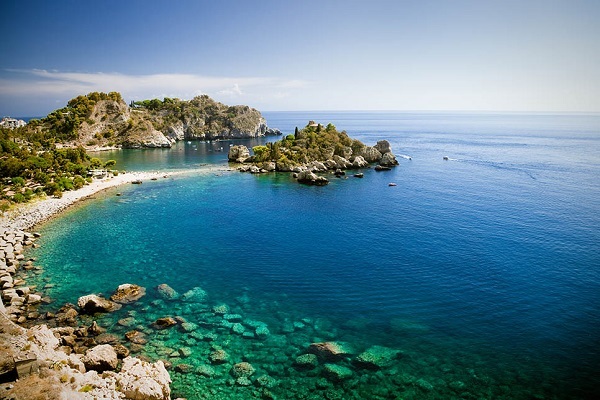 Isola Bella is Taormina’s most photo-friendly beach, a narrow strip of land which links the islet to the mainland. Even if ancient history is not necessarily your thing, it is hard to resist the lure of Taormina’s ancient Greek amphitheatre, not least for the spectacular views it provides along the Ionian coast. 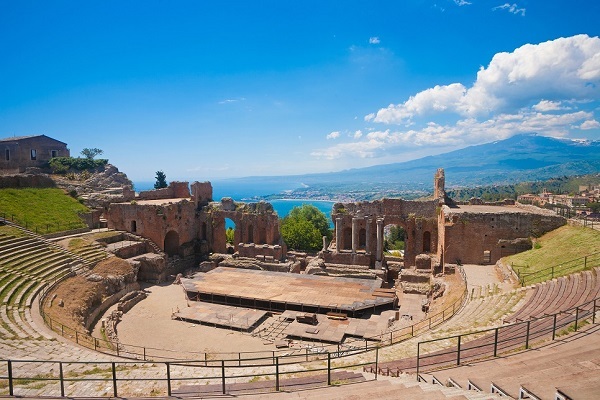 Once the stage for gladiator shows, the theatre now hosts the prestigious Taormina Film Festival in addition to fashion shows and concerts. Head straight for the designer shops displaying exquisite handmade leather bags, shoes and jackets along the main Corso Umberto for some serious window shopping but also take time to rummage through the smaller artisan shops for hand painted traditional Sicilian ceramics and gastronomic treats. Best time to shop? Do it Sicilian-style and incorporate shopping into your evening walk, during your holidays in Taormina. When you holiday in Taormina, the brooding shape of Mount Etna is a constant backdrop. 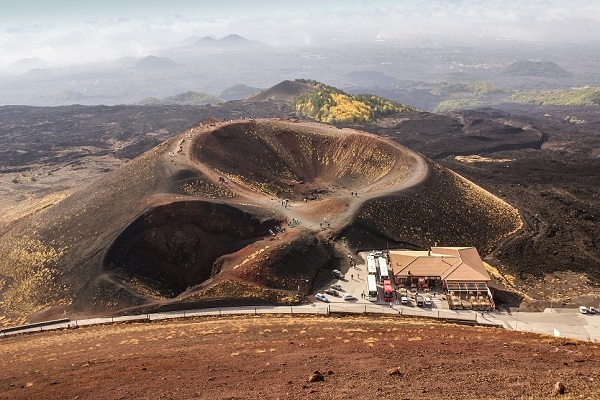 An organised excursion to the volcano is a must and is even more enjoyable if you can incorporate visits to some of the wine-producing villages and vineyards on its lower slopes or combine your trip with other favourite activities such as hiking or mountain biking. 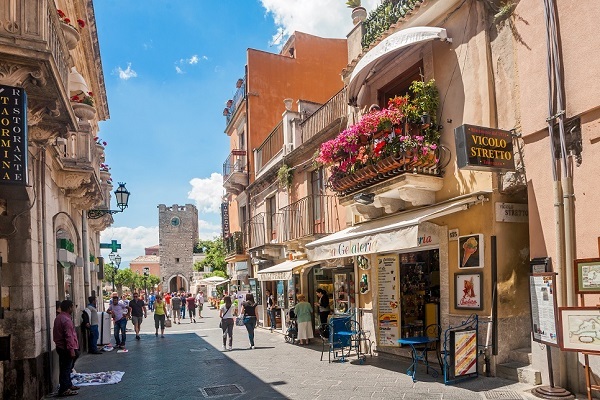 While sophisticated Taormina remains the main magnet for most tourists to the area, other towns and villages along the Ionian coast are certainly worth a visit. 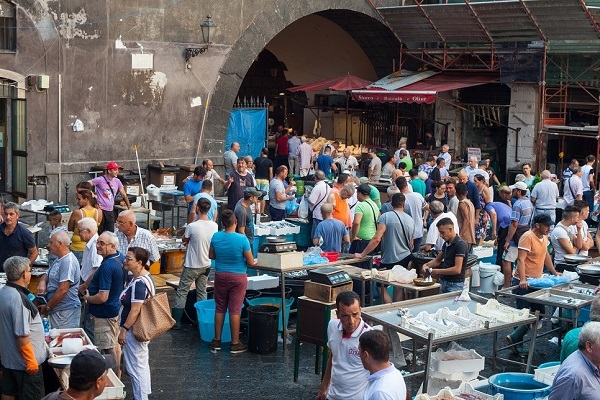 Make tracks for Catania for its street food and lively fish market and for its magnificent baroque architecture; and for the smaller fishing villages, such as Aci Trezza and Aci Castello, which punctuate the Cyclops Riviera’s rugged lava coastline.